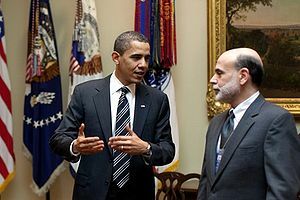 President Barack Obama, left, flanked by Treasury Secretary Timothy Geithner, and Federal Reserve Chairman Ben Bernanke, and Vice President Joseph Biden, right, receive an Economic Briefing, Monday, March 23, 2009, in the Cabinet Room of the White House in Washington. It’s put up or shut up time once again for Ben Bernanke and his fellow policy-makers at the Fed. Had he not been so specific and consistently reiterated his “data dependency” for the past year, then this week’s meeting would be a slam dunk for a taper and the gradual roll-back of the Fed’s $85 billion a month bond-buying program. For the record, last summer when most of the financial world was focusing on a September taper, Fahmy bucked consensus and said there’d be no scale back at all until 2014. And so his current call is really an extension of an older one. He’s not the only doubter in the pack. Wall Street Journal Fed-watchers point out that only two of three main economic criteria have been met, and that inflation – or more specifically a lack of it – continues to fall short of the targets. From his viewpoint, Fahmy agrees that stocks will celebrate the “do-nothing” Fed, saying that he expects the taper timetable will be incoming Fed chairman Janet Yellen’s first inheritance. “He’ll pass it on to Yellen. Maybe the earliest we’ll see would be in March,” he says, and even then, the end of one stimulative program could be offset by the debut of a new and different one. “If they do nothing I think we still have a year-end rally because it shows more accommodation from the Fed,” he concludes. LG’s Flexible Phone: Funky Feature or Simply a Fad?